Auguste Bonheur has dared - and it is great audacity - to unvarnish nature, to take away the smoke and the dirt, to wash off the bitumen sauce with which art ordinarily covers it, and he has painted it as he sees it. His animals have the soft and satin-like skin of well-to-do animals; his foliage, the bright freshness of plants washed by the rain and dried by the sun. Like his sister, he paints oxen with remarkable truthfulness, but in her overshadowing fame that of the brother has been lessened, and he has not always received the praise justly his due. As Auguste was also an “animalier” and worked on subjects close to Rosa, his name is often eclipsed by Rosa’s fame, when in actuality, his work merits serious re-evaluation. Auguste Bonheur was born in Bordeaux on November 3rd, 1824 to Oscar-Raymond and Sophie Bonheur. His father was a successful artist who received his training in Bordeaux under Pierre Lacour (1778-1859). After establishing his career, he became a teacher and married one of his pupils, Sophie Marquis. Both of Auguste’s parents were engaged in artistic activities - his father gave art lessons and his mother gave music lessons, providing a fertile ground for their children to gain an appreciation in the arts, but which provided only a modest income for the family. For the first five years of his life, Auguste and his family maintained this modest lifestyle in Bordeaux. In 1828 Raymond moved to Paris in search of better opportunities and an increased salary, while the family remained in Bordeaux until the end of the year. He found work in a boarding school and gave private drawing lessons, but work was sporadic and the family was forced to move from one residence to another, never finding the exposure to nature that they once had at Bordeaux. Auguste began schooling near his house in the Rue Saint-Antoine, led by a progressive Jansenist teacher, Father Antin. During this time Raymond continued to give private lessons, but when Auguste’s mother died in 1833, life became especially difficult. It was not until 1842 when Raymond remarried that a more stable environment returned to the family. Like his older sister Rosa, Auguste entered his father’s atelier once he was old enough, receiving his only formal training there. 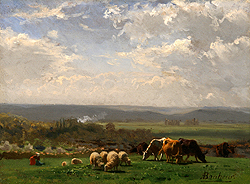 Throughout his life his father would be his only teacher, extolling the virtues of the new landscape school of painting, saying that the revered artists such as Horace Vernet were of the past and that the “new French school would be landscape.” (Henry Bacon, “Rosa Bonheur”, The Century, Vol. 28 (6) October 1884, pg. 834) Raymond’s views on the future of French painting influenced each of his children, determining their thematic routes, especially those of Auguste who excelled at painting landscapes. By 1841 the family had moved into a new residence on the Rue Rumford where they had a large studio on the sixth floor. The residence was situated near many farms, providing each of the children the opportunity to study nature first-hand. In addition to farm animals, the Bonheur family had their own barnyard which housed a sheep, a goat, birds, ducks, and rabbits, among other animals. The animal theme would become an integral part of Auguste’s and the rest of his siblings work during their careers. Such pictures were of course, part of the rural tradition, the difference being that now they were often bought by men who had made money in towns but yearned nostalgically for an image of the country…it was the material reality of the animals depicted, and the ease with which the new picture buyer could relate to them, which won such ready popularity. Not only was this type of painting of much interest to the public, but it was also challenging the established tradition of the historical/mythological landscape by depicting, with more realism and veracity, the objectivity of the animals and landscapes based on actual sites in France. He likes the steep and mountainous sites of the Auvergne and returns often to paint in the Cantal. Under the influence of his sister Rosa, his landscapes are enlivened with herds. He also works in the forest of Fontainebleau, Brittany, the Pyrénées, on the banks of the Rhine, and in Scotland. Auguste was known to collaborate with his sister on a number of works. 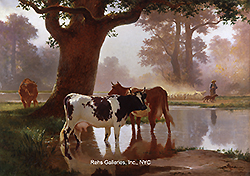 His works were “rather prettier than Rosa’s, but like hers were almost always of animals in landscapes.” (Rosalia Shriver, Rosa Bonheur, Philadelphia: The Art Alliance Press, 1982, pg. 42) He continued to exhibit at the Salon and received a third-class medal in 1852, with two views of the area surrounding the Cantal and Intérieur de Forêt, Fontainebleau (Interior of a Forest, Fontainebleau). In 1859 he exhibited Troupeau de Vaches (Herd of Cows), Le Passage du Gué, Souvenir du Mont Dore (The Passage of the Ford, Souvenir of Mount Dore), L’Abreuvoir, Souvenir de Bretagne (The Watering Place, Souvenir of Brittany), in addition to two others, and received a second-class medal. He received his first, first-class medal in 1861 when he exhibited L’Arrivée à la Foire, Auvergne (The Arrival at the Fair, Auvergne), Rencontre de Deux Troupeaux dans les Pyrénées (Meeting of Two Herds in the Pyrénées), and La Sortie du Pâturage (The Departure from the Pasture). Auguste was also a frequent exhibitor in England, showing works in Manchester, Leeds and London. He continued to paint and exhibit his work until his death on February 21, 1884. In honor of Auguste’s recognition within the art world, he was named a Chevalier de la Légion d’Honneur in 1863, proving that his work, as well as his sisters, had made an impact. Auguste Bonheur combined his family’s love of animals with his own interest in landscape painting - reminiscent of his contemporaries in the School of Barbizon - to create an oeuvre that sets him apart from other members of his family while aligning him with the interests of other French artists of the period. Today examples of his work can be seen in The Metropolitan Museum of Art, New York (Environs of Fontainebleau: Woodland and Cattle), as well as museums in Amsterdam, Bordeaux, Cardiff, Hamburg.